And because the weather radio had our rain chances at 20% yesterday and it was sunny, Will cut hay. He quit when it started raining two hours later. And by the time he’d gotten home and in the house it rained again. No, make that POURED! Luckily, today (so far) has been sunny and breezy so he’s going out to rake the hay so it can dry the rest of this afternoon and tomorrow until he attempts to bale it. What a year it’s been. Fortunately, the garden and pastures have loved all this rain! I’ve never in my life seen such crops. I have some beans a foot long and Will’s pride and joy, Seneca Sunrise sweet corn (which the cows ate last summer), has nine-inch cobs that are very fat. And LOTS of them. Our new sweet corn, Yukon Supreme, has shorter cobs, about five to six inches, but is very fat and tasty. We ate some last night to try it. It isn’t super sweet but does have nice old-fashioned corn flavor. It appears the variety needs a bit of stabilizing as we got both bi-colored ears and yellow. 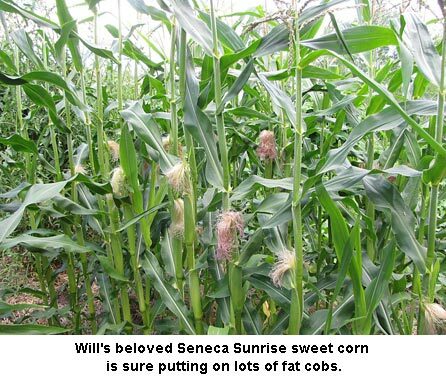 But when a sweet corn produces five ears per seed (it stools out with about four tillers, each having nice cobs!) and matures at 50 days, we sure aren’t complaining! In our big hoop house, the peppers are going nuts. One variety that is super nice is Mt. 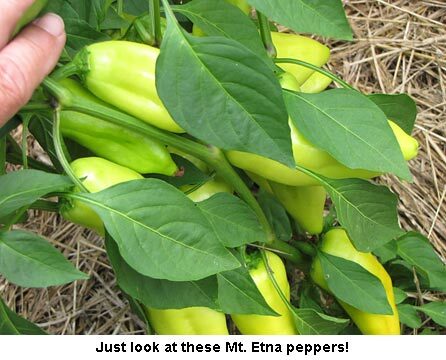 Etna, an Italian sweet pepper. One plant has twelve big peppers with more coming. And the beans? I can’t walk through the hoop house because of the beans EVERYWHERE on the south end — up poles, clinging to the hoops. Very nice. Will has been whacking tall grass so he can turn on the electric fence on the east pasture for the cows. He wanted them out of the north pasture so there was NO chance of them breaking into our north garden like they did last year. He’d even put electric fencing around the 6-foot-tall welded wire fence but didn’t trust them. Besides, the pasture was getting a little eaten down. So first we drove them to the small north east pasture, which is fenced with barbed wire. But it’s only about five acres and they ate the three-foot-tall grass down in a week’s time. 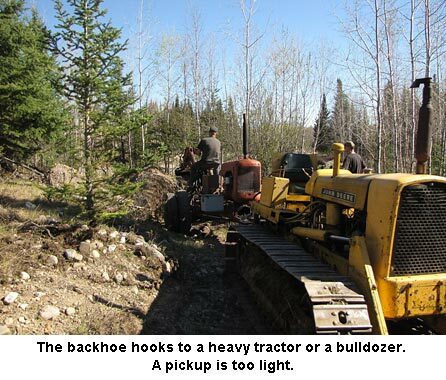 This is the backhoe we bought for $300 from our friend, Tom. The front is an Allis Chalmers tractor with a trailer hitch in place of the front tires. The seat is on backwards for the hoe operator. The hydraulics run off of the “tractor.” Instead of two big rear tractor tires, there are four heavy-duty truck tires to lower the backhoe and support the weight while digging. 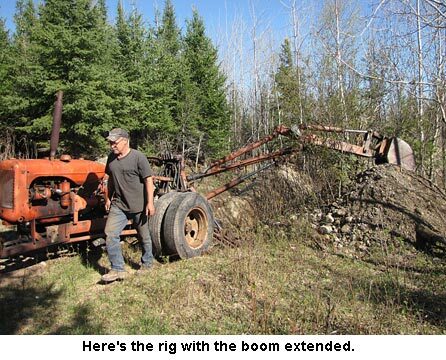 The hoe has outriggers run by the hydraulics to help steady the rig while digging. Ah Ha !! What you have is using the tractor as a “slave” unit not only for the engine but the hydraulics as well. Great idea. Have a 1946 VAC Case that runs very well that would serve perfect for this. Now where can I round up a control valve set and some longer cylinders, I think I have about everything else in my bone pile. Thanks for the pictures. Lets see what happens this winter. LOVE your updates with pictures and narrative about life around Jackie and Will’s place! Thanks for all the news. Hope the weather cooperates for you to get those hay chores done. We have not been able to “trust” the forecasts here either. Strange weather. But, as you say, there are lots of perks to make up for it. 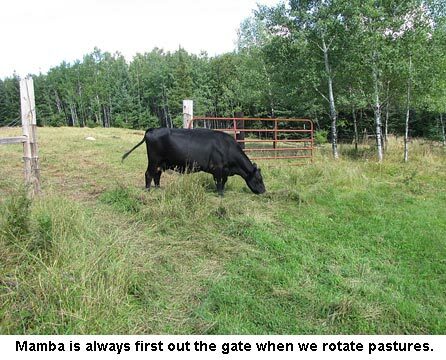 Why, with so much produce, you may be able to feed livestock for half the winter before even needing that hay! We are having trouble getting tomatoes to ripen–the early volunteer we left where it started has been the only source. It has been so hot, the blossoms drop. Cukes, however,…….. And so it goes. Blessings.